C.W. Lemoine | Author » Avoid. Negotiate. Kill. 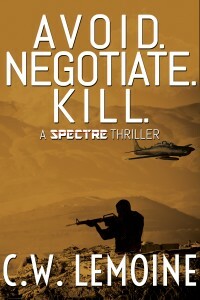 Book 2 in the military/political espionage thriller SPECTRE series finds Spectre with a new job – and a new set of problems. His latest mission will force him to confront political deception, international terrorism… and devastating personal loss. When fighter pilot Cal “Spectre” Martin is recruited by an unacknowledged government organization named Project Archangel, he believes the demons of his past have finally been laid to rest. But when a top-secret mission to secure chemical weapons in Syria goes horribly wrong, Spectre finds himself thrust back into civilian life. Within days of his forced retirement, an unknown agent attempts to assassinate Spectre and his friends. Although Spectre escapes the assassination attempt, one of his friends is killed, and Spectre’s world is shattered by the loss.